That little loan can dig a huge hole for you…. 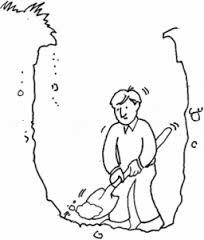 Unsecured lending seems to be a quick and easy way out of a financial crisis but its probably a spade which digs a bigger hole for you. The old saying, “If you find yourself in a hole, the first thing you should do is stop digging”, is so applicable to debt. My wife recently showed me an SMS she got on her phone offering her a a personal loan without any credit referencing at an interest rate of 4,1%. This must be so enticing to someone who is desperate for cash. It offers a quick fix yet is one of the most expensive costs of lending around. The recent rate hike of another 25 basis points brings the repo rate ( the rate that the is charged to the banks by the reserve bank) to 7% and the prime lending rate (the rate which the bank lends money to us) to 10,5%. This simply means that the cost of debt is rising further digging your hole even deeper. Now if you get offered a loan at 4,1% then there must be something more to it as it sounds too good to be true given the new rate of 10.5%. Visiting one of many sites offering unsecured lending for blacklisted applicants I found a calculator which works out the interest over a period of unto 36 months. Taking a R10 000 loan over 24 months costs you R769 per month which means you pay R8 456 in interest. Over 36 months you pay R12 248 for a R10 000 loan! So you pay around 40% per annum. The main problem is that in most cases taking up this kind of loan treats the symptom and not the cause. Sooner or later you will have deal with getting out of debt instead of further into it. At the outrageous cost of unsecured loans your chances of getting rid of your debt make it so much more difficult. The reality is that if you are borrowing to make ends meet you are living above your means. You will be better off finding ways to live under your means. Drastic times call for drastic measures. Even if it means scaling down on the house and or car. Borrowing at rates of 40% certainly won’t improve things.